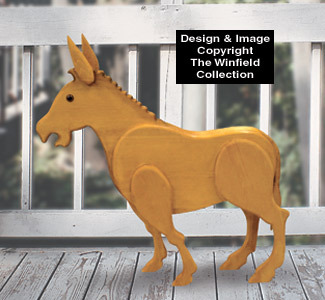 Our exclusive little Garden Donkey is an enchanting country addition for any yard or garden! Save Money! Garden Donkey and Cart Pattern Set also sold below. 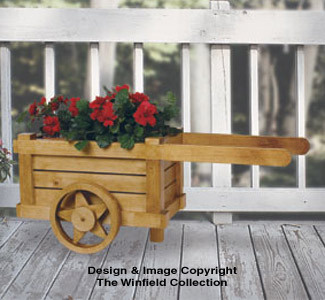 Our charming little Garden Cart will add a warm country look to your favorite little outdoor spot! Easy to make project can be left natural as shown or painted the colors of your choice. Holds two standard 6" pots and measures 37" long x 15" tall. 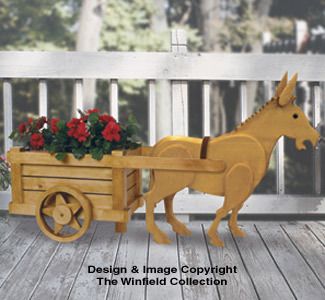 Add a great country look to your yard or garden with our delightful 3D Donkey nimbly pulling his little Garden Cart Planter! Project can be left natural as shown or painted the colors of your choice. Cart holds two six inch pots and measures 37" long x 15" tall. Donkey measures 30" long x 29" tall. Make both from this money-saving pattern set (#Z-1930 Garden Donkey and #Z-1860 Garden Cart.